NAUGATUCK — Jo Ann Piper learned to knit by watching her grandmother when she was five years old. 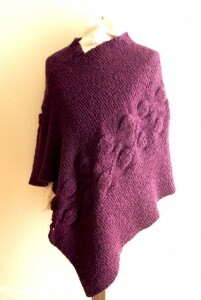 Soon, she learned to read knitting patterns from a cousin and knit her own sweater. “I was hooked after that,” Piper said. She started knitting and crocheting scarves, hats, and socks for friends and family. Two years ago, Piper started trying to sell her creations. “It’s a slow process,” Piper said. She set up an account on Etsy, an online store for crafters to sell their wares and started networking with other artists on the site. With a few needles and a lot of time, Piper’s clever fingers turn a spool of wool or silk yarn into ponchos, neck warmers, infinity scarves, afghans and fingerless gloves. She also felts hats by putting wool through the washing machine. She said her most popular item is socks. “They’re a hot commodity,” Piper said. 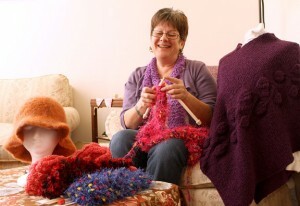 Piper said she likes to work with intricate patterns and knitting provides her an outlet to relieve stress. “For me, it’s relaxing. … If I’ve had a very stressful day, it’s kind of an escape for me,” Piper said. She works on her projects when not working part-time in Seymour or taking care of her five children, ages 8 to 26. Her clothing takes anywhere from a few hours for a scarf to a couple of weeks for a sweater to knit or crochet, she said. She said people like hand-made clothing, but it can be expensive. However, Piper said customers get what they pay for. People simply can’t order custom items in certain colors and materials from a store. Since she’s just starting out and trying to build a name for herself, Piper’s prices are pretty low compared to the number of hours she spends on each piece. “Once the sales start coming in, then I can start charging a little more,” Piper said.